First of all, I apologize for my scruffiness but it was a super casual retro polo kind of day. I wanted to share a couple of my most favorite purchases as of late. I haven't had a post about nails for a while and although it is completely not the season (unless you are an Aussie ;) I have been completely obsessed with a color from China Glaze called "For Audrey." It's the color of Tiffany's blue! I had been scouring for this color everywhere... Ever since I saw one of my favorite Zipia.net models wearing it, it was lust. Just a simple creme light turquoise polish, and I had come up with disappointment after disappointment until I found this. It's so love! I wanted to see the color so I just did one quick layer but even with just one, it's so opaque! I was impressed. I also bought Red-Curl Grl and Blushing by China Glaze but I have yet to try them out. For anyone wanting to get polish online, I bought mine from http://8ty8beauty.com/ and they shipped quickly and safely. 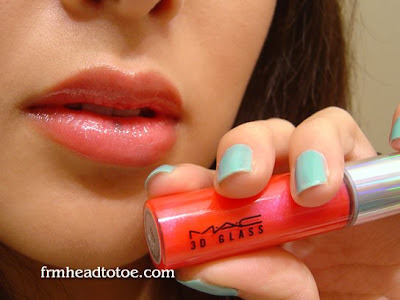 I also recently discovered a Cosmetics Company Store about 20 minutes away from my house and in the excitement of the new discovery, bought MAC 3D Glass in Racy. Apparently the 3D glasses were less sticky and more moisturizing than their lipglass brothers. I have to say, I really love it. Racy is a sheer yet pigmented hot pink-red color that really brightens your lips. My bathroom is dark so you can't tell, but it's a stronger color than it looks here. i LOVE those two outfits you posted from zipia! i WISH i can order for there, but my god, isn't it like a $500 minimum purchase since it's a whole-sale type of online clothing store? if not..then i sure would love to order from there...they've got CUTE stuff. In your post for your light blue contact lenses you posted some pictures and I like your hair bangs and was wondering how you style them so they stay piecey like that, especially in the first pic. ichigobunny: Yes, I know what you mean. Zipia is so expensive! But I just look at the pics for inspiration. anonymous: I use a texturizer paste... I have a couple different ones I use and they all work the same. Just put a tiny bit on your fingertips, rub to warm up the product, and twist pieces of your bangs together how you like at the tips. Hope it helps! I love those minty nails. So fresh looking! it really is the same tiffany's blue. Awesome! another add-on to my wanted list. And Kim Jin Hee (that model from zipia) is one of my fav models too, jst that she's a little too tanned. Oops, forgot to introduce myself, i'm a new reader from Singapore! And u're really really pretty, and Korean!